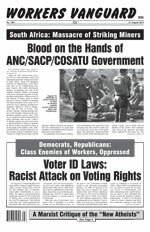 Under the guise of preventing voter fraud, what is unfolding is a naked assault by the Republican Party on the right to vote, particularly of black people, in the upcoming presidential elections. (In 2008, 95 percent of the black vote went to Obama.) The racist impact of the voter ID laws introduced in 34 states in 2011 and in 14 additional states this year is evident. For example, the strict Indiana requirements, found constitutional by the Supreme Court in 2008, were projected to disenfranchise 19 percent of potential black and Latino voters, as compared to 12 percent of whites. Others will be disenfranchised, too: one-third of women do not have easy access to documentation with their current legal name, and the homeless are likely to have substantial difficulty meeting the tightened residency requirements. A study by the Brennan Center for Justice estimates that these laws could deny suffrage to more than five million eligible voters. The potential loss of voters who in the main are likely to go for Obama greatly exercises Democratic Party supporters. They have rightly pointed out that there is no evidence of any significant fraud by voters in this country and have launched a bevy of suits challenging these laws. At the same time, Barack Obama and the Democrats have helped set the stage for this offensive against voting rights, not least by peddling the myth that racial oppression is a relic of the past long since overcome. Such arguments are the basis for suits filed by several Republican-controlled states to annul key provisions of the 1965 Voting Rights Act that came out of the civil rights movement. There is no question that the voter ID laws delight the Tea Party yahoos, who are prone to deny that Barack Obama is a U.S. citizen or that black people are part of the species homo sapiens. Following a recent decision by Ohio officials to effectively shorten early voting hours in urban areas, a Republican county chairman commented in PC code: “I guess I really actually feel we shouldn’t contort the voting process to accommodate the urban—read African-American—voter turnout machine.” Many of the recently enacted voter ID bills echo “model legislation” distributed by the American Legislative Exchange Council, which also has pushed the “stand your ground” laws promoting racist vigilantism. This right-wing think tank is bankrolled by the Koch brothers who loomed large in Wisconsin governor Scott Walker’s attack on the public workers unions there, as well as by other reactionary fat cats and mainstream corporations (AT&T, Bank of America and others). Vote stealing is bipartisan and as American as apple pie. The election of John Kennedy in 1960 by the narrowest of margins is widely attributed to voting “irregularities” perpetrated by the Democrats in Chicago and Texas. It is almost certain that Al Gore lost in 2000 because black votes in several Florida counties were disappeared. In neither case did the swindled party protest with great vigor. Both the Republican and Democratic parties are bourgeois parties committed to the maintenance of capitalist rule and have little desire to disturb the orderly succession to the imperial presidency. The ballot is a fundamental right that must be tenaciously defended. Depriving the oppressed of basic democratic rights underscores and reinforces their vulnerability in the face of reaction. After the smashing of the Southern slavocracy in the Civil War, the liberated slaves were extended their rights as citizens, including to vote and to hold office, rights that were enforced by Union troops in the South. The last of these troops were withdrawn as part of the 1877 Compromise in exchange for the Democrats dropping any challenge to Republican Rutherford B. Hayes becoming president. With the Democratic Party as its architect, the system of Jim Crow took hold in the South, forcibly segregating black people at the bottom of society. Not a few were murdered during the civil rights movement for fighting against segregation and to regain the right to vote. In this period, the Republicans began their drive to supplant the Democrats as the foremost party of racist reaction. Democrats often were more zealous than their Republican counterparts in pushing for sterner drug laws and longer sentences, most notably and notoriously the Rev. Jesse Jackson, who proclaimed that “dope” was more of a threat to black people than was the Jim Crow-era lynch mob “rope.” Today, 13 percent of all black men have felony convictions, with most of these denied the franchise by law. The Spartacist League stands opposed to any and all restrictions on the rights of citizens, including felons, to vote, and in favor of the extension of full citizenship rights to all immigrants—including the right of franchise. We also call for the decriminalization of drugs. What has been put in place by the vote can be undone by the vote. And although the right to vote is important, fundamental change requires class and social struggle. It was the Union victory in the Civil War that ended chattel slavery; it was the giant labor battles of the 1930s that won organizing rights; and it was the mobilization of thousands upon thousands of fighters against segregation that brought Jim Crow to an end. And it will not be the ballot that abolishes this racist, capitalist order. That will require forging a revolutionary workers party to overturn it through socialist revolution. Chattel slavery was the foundation stone of the American capitalist system. Its continuation is buttressed by the race/caste oppression of black people that has served to divide the working class, with the result that the U.S. remains the only advanced industrial nation without even a reformist labor party. At the same time, black workers are a strategic component of the working class. The joining of the fight for black freedom to the struggle against all exploitation and oppression is the Achilles’ heel of the U.S. imperialist system. In protesting the judicial decision on Pennsylvania’s voter ID law, AFL-CIO president Richard Trumka fulminates that such laws “undermine our democracy.” Trumka’s actual concern is that they undermine the Democratic Party, but neither is the U.S. “our democracy.” Capitalism, in both its “democratic” and totalitarian wrappings, has produced two world wars and the Great Depression and has long outlived any progressive role. Given the rotten record of whatever Commander-in-Chief is in office, it normally falls to the liberals, the trade-union tops and the reformist socialists to exhort working and poor people to run to the polls to vote against the greater evil—invariably the Republican candidate. The simple fact is that it is never in the interests of the exploited and the oppressed to vote for the Democrats, Republicans or any other capitalist party. Continuing to spread illusions in the lesser bourgeois evil only delays the fight to forge the revolutionary socialist party that will consign bloody capitalist imperialism to the ashcan of history.